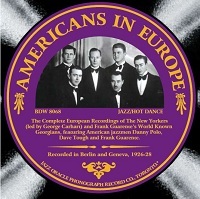 This important compilation includes the complete recordings of the New York Tanz Orchestra, led by George Carhart and featuring Danny Polo and Dave Tough, as well as the complete Swiss recordings by Frank Guarente’s Georgians. These rare sides have never been reissued in their entirety before. The 44-page booklet includes extensive notes by renowned author and researcher Rainer Lotz, as well as rare photographs and ephemera. Sound restoration is by John R.T. Davies and Ted Kendall. Evelyn Bazell (t), Herb German (tb), Danny Polo (clt, as, arr); Milton Allen (ts); Jack O’ Brien (p); Tony Morello (g – 1, bjo – 2); Dave Tough (d); Al Bowlly (vocal-3). Evelyn Bazell (t), Eddie Norman (tb), Danny Polo (clt, as, arr); Andy Foster (ts); Jack O’ Brien (p); Tony Morello (g, bjo, uke, vocal-1); Dave Tough (d); ensemble (vocal-2). Frank Guarente (t), Ben Pickering (tb), Eddie Bave (clt, as, ts), Ernie White (clt, ts, as), James Murray (p), Arthur Sherman (bjo), Jack Ryan (bb), Teg Noyes (d, vocal-3).